← Friday 16th May 2014 – I had an hour to spare. The perfect way to spend a sunny Saturday. 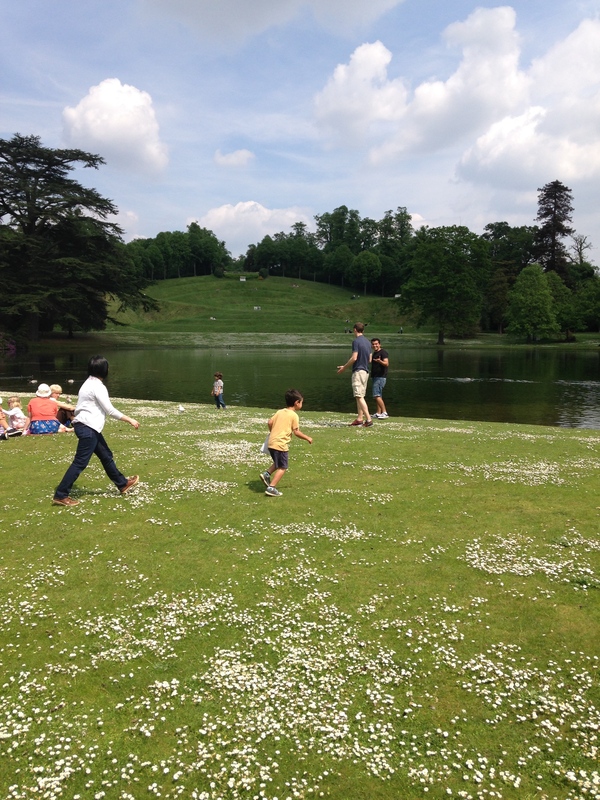 As the weather was going to be gorgeous, I thought why not go for a family day out to a National Trust place. Having looked through the book, I decided that as we only had the morning and the first part of the afternoon free, that it would be best to visit somewhere fairly close. So Claremont Landscape Gardens was the answer. Now I’ve taken the kids here a couple of times before, but Mark hasn’t. It’s not far from where we live and only takes about 25 minutes to drive. As we were walking round by the pond we saw loads of fluffy ducklings. Oh they were so lovely, but their parents made sure you didn’t get too close. As we wandered round the kids found a tree stump, it was huge, and hollow inside, so climbing in it just had to be done. 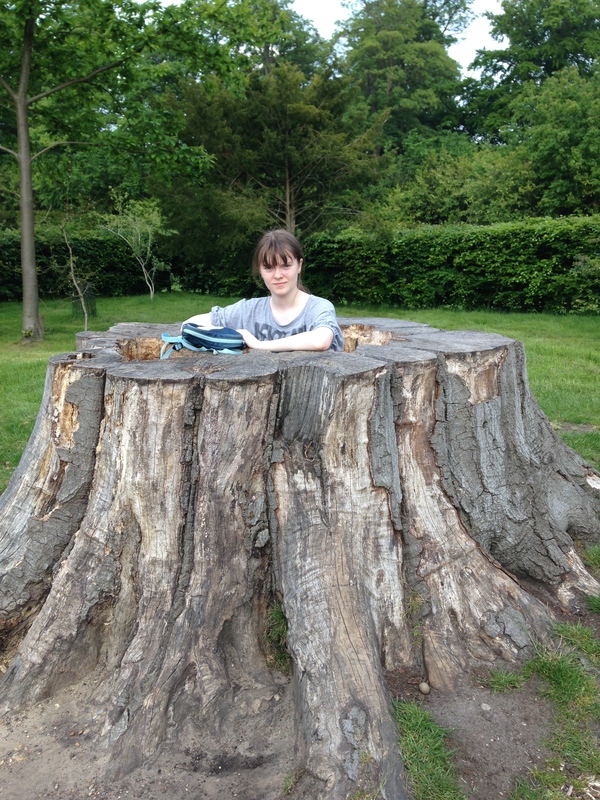 Emily resting in the tree stump. As we walked round we saw some of the most amazing views. There is an amphitheatre carved into a hill, and George timed himself as he ran from the bottom to the top. Apparently it took him 50 odd seconds. It’s much quicker coming down, because you just roll, which of course George had to try. There is also a grotto by the lake, which you’re unable to go into, but if you could it would be the most wonderful hiding place. The Amphitheatre carved into the hill. 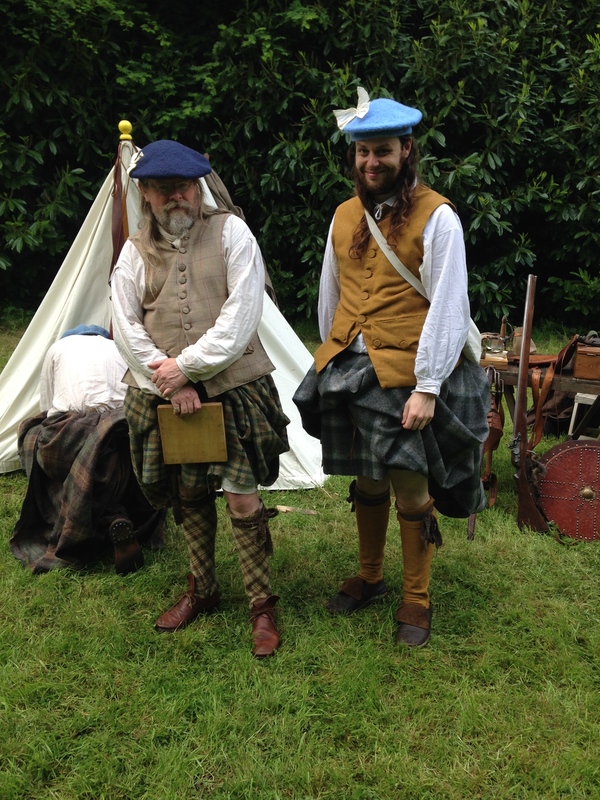 They also had men and women rein-acting a Jacobite Rebellion. They were either dressed as a Highland Soldier or a Redcoat Soldier. They had bayonets, swords and rifles, and had set up camp with tents in their own little area. They fired their guns, which were really loud and the birds in the nearby trees fled. There was lots of shouting, but nobody got injured. A pair of men in their costumes. We thought the guy on the left looked like Si from the Hairy Bikers. 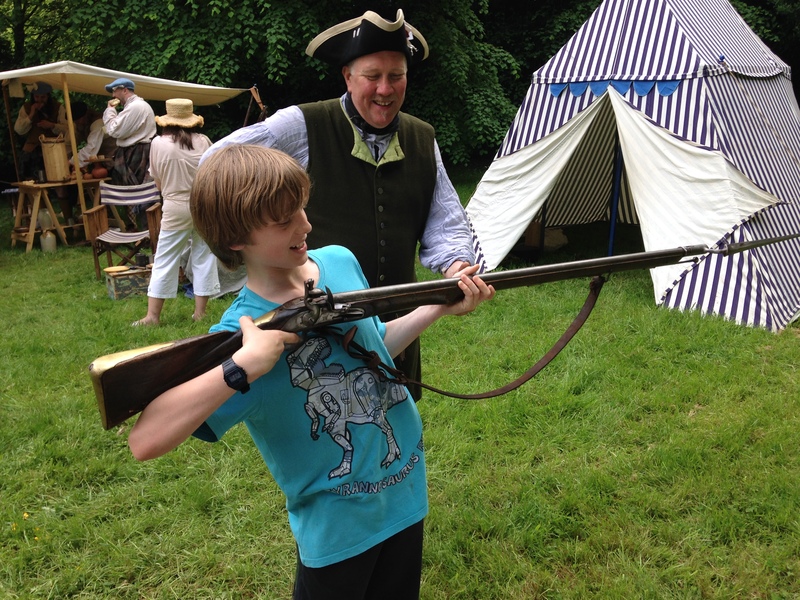 As we were looking round their camp, we were all allowed to try out holding their guns. 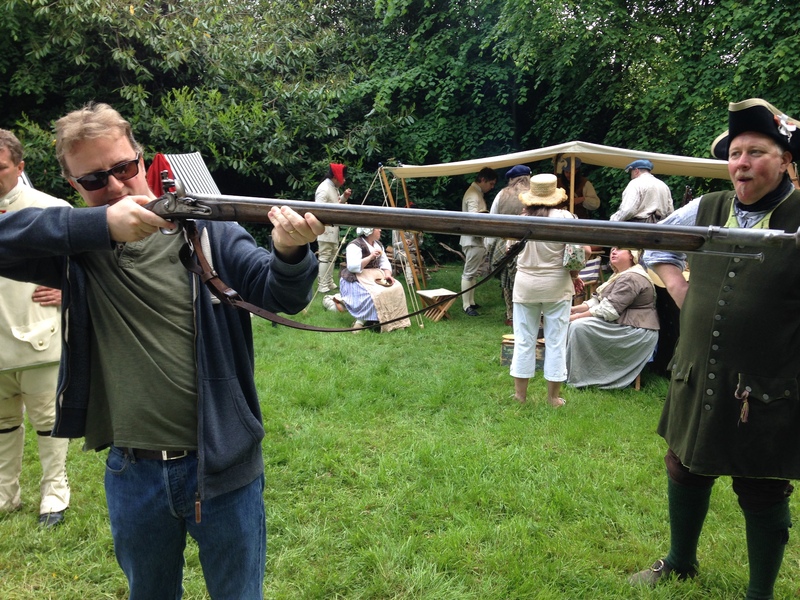 Even George was allowed, and they put a bayonet on the end of the gun. Wow they were very long and heavy, and really quite uncomfortable to hold. Apparently if you want to buy one they cost about £400!!! I think we’ll pass on that one. The man who let us have a go on them, told us all about the battle, and how to load the guns, it’s a long process and very fiddly. Emily preferred to have a go with the sword, to be honest I don’t blame her. George having trouble with his gun, I don’t think his arms are long enough. Mark looks the part, a little like Arnie…. Maybe I should borrow this to protect my veggies? Then we went for lunch and then came home. Such a great day, and thoroughly enjoyable. Must go as it’s time to start the BBQ. This entry was posted in Uncategorized and tagged Arnold Schwarzenegger, claire's allotment, Claremont Landscape Gardens, hairy bikers, National Trust, Simon King. Bookmark the permalink. 4 Responses to The perfect way to spend a sunny Saturday. Lovely day out indeed – maybe a place I will visit one day. 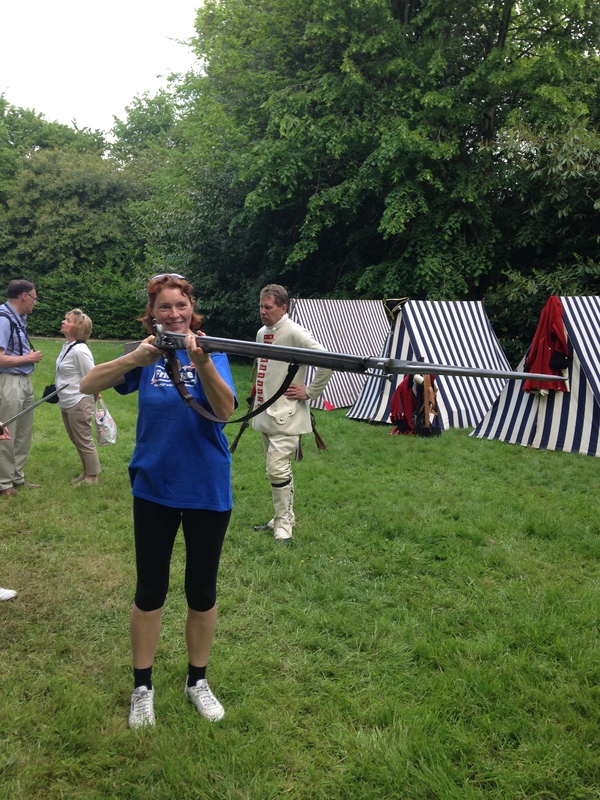 It’s great when their are interactive things, like holding a bayonet and trying it. Yes it’s great to try something new. Are the foxes causing damage to your crops? We do have a family of foxes on our site, but they don’t seem to trouble us. They don’t come out during the day.